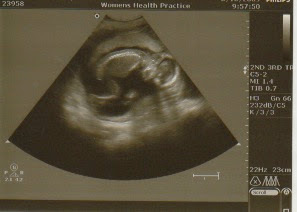 Here is a picture of Fig from the ultrasound we had yesterday. The whole time, Fig was moving around like a little fish. I was actually pretty surprised to see that, since I haven’t felt Fig move at all (at least I don’t think I have). At one point, Fig did wave his/her little arms, and when the technician was trying to look at Fig’s feet, he/she was moving them around and rubbing them together. We could actually see Fig’s little heart beating. I think my favorite thing though, was Fig’s vertebral column. It was so bright and lovely. And just for good measure, here's a grainy web-cam picture of my belly. 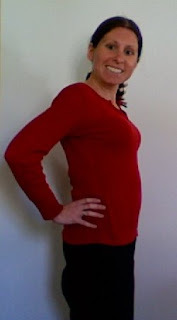 I weigh probably about what I did in high school... my pre-vegan, pre-marathon running days! WHAT A DARLING PICTURE OF BABY FIG!! AND YOU LOOK FANTASTIC!!!!! p.s. i vote for Robbie to have a doula, too. I wish I was still the same weight that we were in high school. I don't think I have ever seen such a clear ultrasound. And, you would never guess by your picture that you have been so sick. This is so much fun being able to share this "ride" with you and Rob. Thanks for sharing! My name is Margie Hicks I was browsing internet and found your blog. The author did a great job. I will subscribe to your RSS feeds. Thank you for your contribution. I am a web designer myself. And here some examples of the websites that I designed for loans payday loans online company.